We arrived around 5pm on a Friday night and pretty much had the place to ourselves. There were two tables reserved and two others occupied, so we found one near a window so we could actually see what were eating. It’s pretty dark in there! We ordered some garlic cheese bread, a veggie pizza, and a sausage and pepperoni pizza. The menu even features a 7″ “Dwarf” sized pizza which made us chuckle. 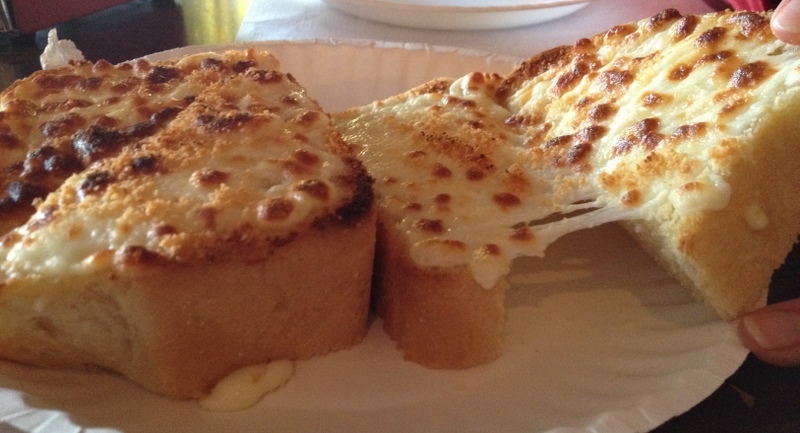 The garlic cheese bread arrived fairly quickly and was presented on, wait for it, a stylish paper plate. Old school. The bread was sliced thick and had nice, light garlic flavor to it; nothing overpowering. It would have been better if it had some marinara for dipping, however. Our pizzas arrived a bit later and were served on the standard silver pizza tray. Styrofoam plates are brought with the pies. I get the feeling they don’t like to do too many dishes here! Bernie produces a medium to thick crust. The edges are quite high. It reminded me a bit of Godfather’s Pizza crust. Bernie’s crust is very light in color with no browning on the bottom even though they are cooked in Vulcan deck ovens (they have two Vulcan deck ovens; one is the original single deck and the other is a ‘newer’ double deck oven). Even though the crust is thick, it’s surprisingly light and airy, and almost had a snap when taking a bite. The sauce here is good. It’s sweet and flavorful, but there sure isn’t much of it. They are pretty stingy on the amount of sauce they use on the pies. I don’t like my pizza swimming in sauce, but a little more would have been welcome. 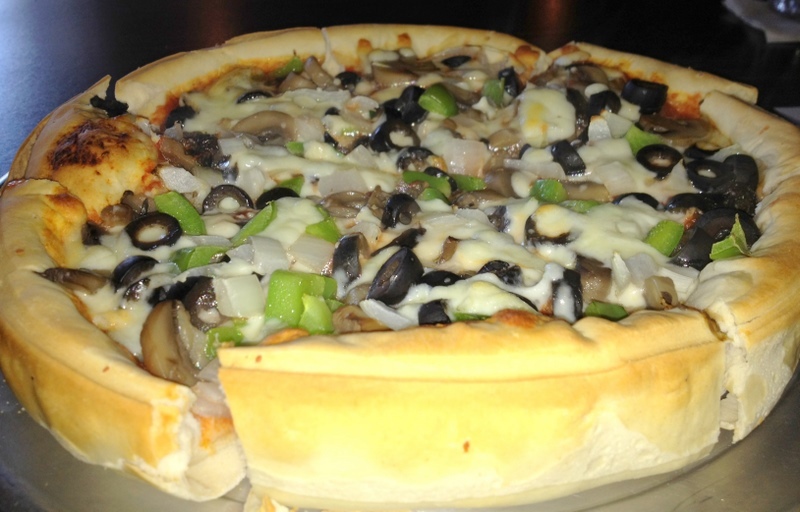 The veggie pizza was a traditional veggie pie with onion, green bell pepper, loads of black olives, and canned mushrooms. There wasn’t anything that made Bernie’s pie stand heads and shoulders above the rest, but the Pizza Wife really enjoyed it. Part of that may have had to do with the fact she knocked back two beers with dinner. The pepperoni and sausage pizza was pretty tasty. There were plenty of pepperoni and the sausage was quite good as well. Very small bits of ground sausage covered the pizza. The cheese was used about as sparingly as the sauce, but both under and on top of the toppings which was an interesting touch. There just wasn’t much of it on either pizza, which was a bit of a bummer. It had been nearly 20 years since my last visit to Bernie’s and to be honest, I wasn’t even sure they were still in business. I’m sure the thousands of cars that pass by on Q street every day wonder the same thing from time to time as there never looks to be much going on there. I’m glad we stopped in and I’m pleased to say that Bernie is still cranking out the pies! How would you rate Bernie’s Pizza? Click on the stars below! This entry was posted in Pizza and tagged Bernie's Pizza Parlor. Bookmark the permalink. Awesome pizza. I love that you can still find Bernie making pizza at Bernie’s. 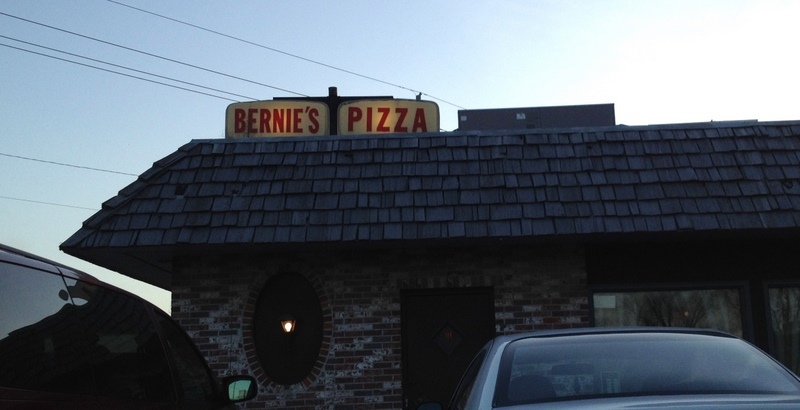 Need to add Bernie’s to our Nebraska pizzerias list. When I do, I might just type, “need to ask for extra sauce” next to their listing. It’s never good to be stingy with the sauce. 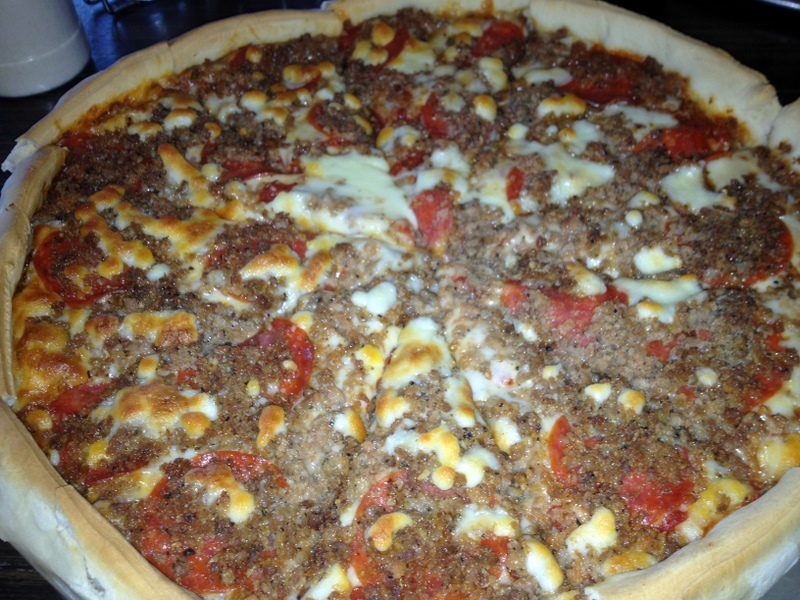 We have been enjoying Bernie’s pizza for over 40 years. Just celebrated my 65th birthday tonight with the ladies from my neighborhood. They loved the pizza, the service was great and a great time was had by all. It’s a favorite place for my children and their kids to eat. (Grandkids ages 2 to 22) can’t get any better! Just tried the reopened Bernies pizza. I have eaten here before but it’s much better this time. The all meat pizza is definitely delicious.